Franklin Avenue reader Paul Haddad tips us off to a new book about the Dodgers that he has just written and released through Santa Monica Press. 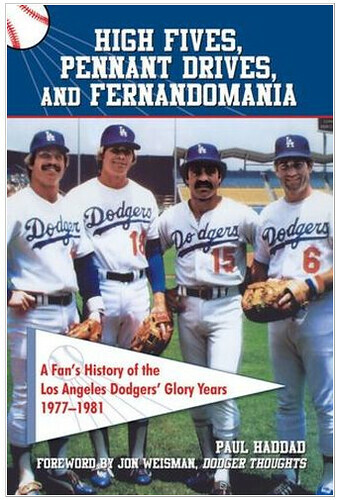 "High Fives, Pennant Drives, and Fernandomania: A Fan's History of the Los Angeles Dodgers' Glory Years, 1977-1981" is a look back at the team's late 70s heyday. "It's an ode to the Dodgers of our youth, and Vin Scully," Paul tells us in his note. "Much of my narrative includes transcripts from Vinny, taken from my childhood collection of recordings, that really take the reader back. You can hear a lot of these old radio calls on my website for the book: DodgerGlory.com. Our pal Jon Weisman wrote the Foreword. Read more about it in a recent Los Feliz Ledger here. Haddad will be on Larry Mantle's Airtalk on KPCC 89.3 FM *today* from 11:40 am to noon.